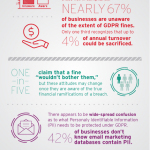 DALLAS--(BUSINESS WIRE)--With the General Data Protection Regulation (GDPR) taking effect May 25, 2018, businesses around the globe should be preparing accordingly. However, through a recent survey, Trend Micro Incorporated (TYO: 4704; TSE: 4704), a global leader in cybersecurity solutions, found that C-suite executives are not approaching the regulation with the seriousness required, resulting in overconfidence when it comes to compliance. The company’s research reveals a robust awareness of the principles behind GDPR, with a strong 95 percent of business leaders knowing they need to comply with the regulation, and 85 percent having reviewed its requirements. In addition, 79 percent of businesses are confident that their data is as secure as it can possibly be. However, Gartner Inc. predicts that by May 25, 2018, less than 50 percent of businesses will not be in full compliance with GDPR requirements. The research company suggests organizations begin preparing now by focusing on five high-priority changes. Despite this perceived awareness, there is some confusion as to exactly what Personally Identifiable Information (PII) needs to be protected. Of those surveyed, 64 percent were unaware that a customer’s date of birth constitutes as PII. Additionally, 42 percent wouldn’t classify email marketing databases as PII, 32 percent don’t consider physical addresses and 21 percent don’t see a customer’s email address as PII, either. These results indicate that businesses are not as prepared or secure as they believe themselves to be. Regardless, this data provides hackers with all they need to commit identity theft, and any business not properly protecting this information is at risk of a penalty fine. In addition, it turns out businesses aren’t sure who should take ownership of ensuring compliance with the regulation, either. Of those surveyed, 31 percent believe the CEO is responsible for leading GDPR compliance, whereas 27 percent think the CISO and their security team should take the lead. However, only 21 percent of those businesses actually have a senior executive involved in the GDPR process. Meanwhile, 65 percent have the IT department taking the lead, while only 22 percent have a board level or management member involved. Trend Micro’s commitment to GDPR compliance begins with its cross-generational XGen™ security, which protects personal data throughout enterprises. Its solution is optimized for all environments where data may be stored, whether that’s physically, virtually, on the cloud, or in containers. XGen is a strategy and platform spanning across all Trend Micro solutions, connected to alert and reporting data breaches as they happen. This approach provides businesses with the state-of-the-art tools mandated by GDPR.